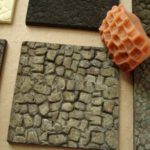 From rolling stock to building brick work, dry brushing gives your models an extra dimension and makes the difference between a painted plastic model and an authentic super-realistic replica for your railways. Dry brushing is a fine scale model painting technique to accentuate the detail of raised surface elements on a model that would otherwise be lost with normal paint. Pulling out these areas adds depth and character, wear and tear and bring models to life. Note: As it’s used to highlight raised areas dry brushing is usually done AFTER the base paint layers, washes and shadows have been applied. In simple terms, it’s done by using a stiff, short, brush with most of the paint removed and delicately touching raised sections. Of course there’s more to it and mastering dry brushing takes practice but follow this ABC guide from the model painting guru at scalemodelguide.com and you won’t go far wrong. I find that making it a little thinner consistency than would be used for normal brush painting works best. 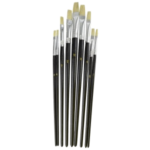 Dip the end of your brush in the paint and make sure all the bristles are well soaked at the end then try to remove as much paint as possible. Transfer the brush to a paper towel and gently wipe the brush on the towel until it leaves almost no mark. You’ll want a short flat brush for dry brushing. 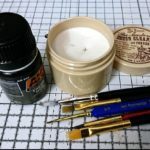 Scot Taylor at ghostofzeon — another good model painting resource — also recommends using an old brush as this technique tends to ruin brushes and the fine bristles of new brushes aren’t needed for dry brushing. Another useful tip comes from airfieldmodels.com, who suggest using a “soft bristled brush when you want subtle shading and a stiffer brush for picking out highlights”. Be careful not to leave to much paint on the brush, test it spare plastic beforehand. The idea is to apply the minimum amount of paint to your model not the most. Lightly draw the brush back and forth over the high spots of the model. You will need to brush back and forth many times as the best effect is achieved the with slow gradual build up of paint. The direction of brushing is very important and should be perpendicular to any edges or raised detail. Also be wary of the paint drying on the brush, you may need to clean the brush several times during the process. Read the full article at scalemodelguide.com. To finish, here’s a video of the technique in practice by modeller Jenny Kirk which covers most of the above techniques.